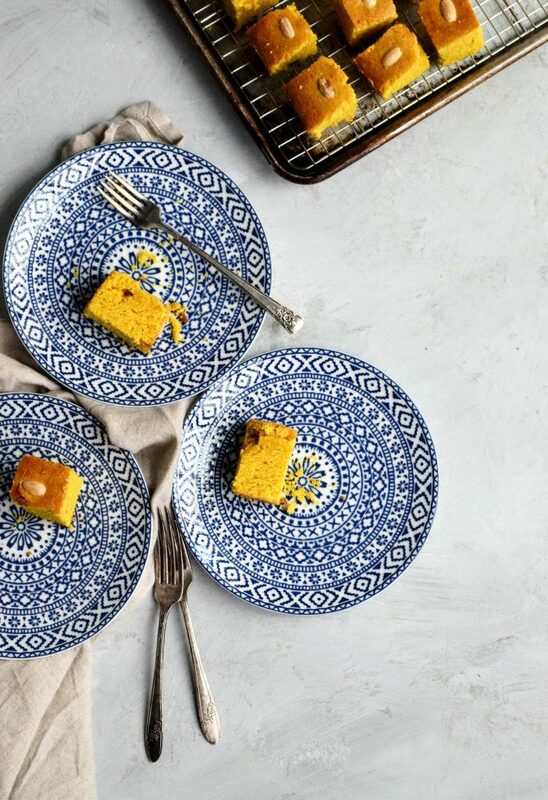 Sfouf, Lebanese semolina cake with a yellow hue. There is something about the smell of Lebanese desserts that just whisk me away to my childhood. Rose water, orange blossom water, anise, mahlab, those are the most intoxicating smells. So much so, that the second my son walked in the door from school today, he asked if I made batlawa (Lebanese baklava), it’s that aroma, even HE knows and loves. This cake is however not like batlawa, it is a cake that is served with coffee or tea. A simple breakfast cake similar to cornbread or biscotti and just sweet enough. When I was growing up I remember my mom having coffee dates with her friends. They would come by the house, a pot of Turkish coffee steamed on the stove and my mom would have some cookies or cake, like this sfouf to enjoy. I was lucky enough to get my own coffee cup and dunk cookies or cake into it. I got all the coffee goodness soaked in through my sweet treat. This cake is perfect for that, and brings back so many memories. Plates of Sfouf cake shared with friends over coffee. In Arabic, Sfouf literally translates to “lines” so to me, the most important part of this cake is the nuts all lined up perfectly in rows. Definitely not important to the taste but just helps with the appearance of the cake to its intended look. Like many Arabic desserts, Sfouf contains semolina. Semolina is coarse, purified wheat middlings of durum wheat and is typically used in pasta (that’s why pasta has a yellow hue). The semolina gives the cake a distinct nutty and flavorful texture. 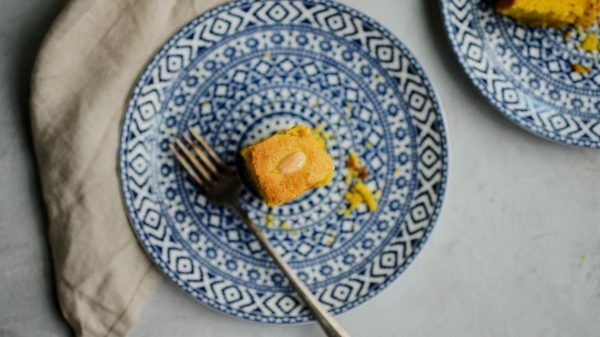 Semolina cakes comes in a few different forms in Lebanese cuisine: sfouf the simplest cake, numoora which is similar in color and taste but is soaked in a sweet attayr sauce that turns it from simple to addictive and finally sfouf bi dibis, a cake using date molasses. But what about it’s yellow color? But let’s be honest, the small amount in this cake won’t necessarily cure all the above ailments, but it does look pretty and taste good! To benefit from the full benefits of turmeric you’d need to consume a lot or take supplements. So if you’re craving a luscious chocolate gooey slice of cake, sorry to disappoint. This cake is definitely not going to hit that sweet spot for you. It is however tasty, warm and amazing, especially on those cold fall and winter mornings. It’s a one bowl mix (my fav), no eggs and can easily be made vegan by swapping the milk. I hope you give it a try and share your thoughts on this Lebanese classic. 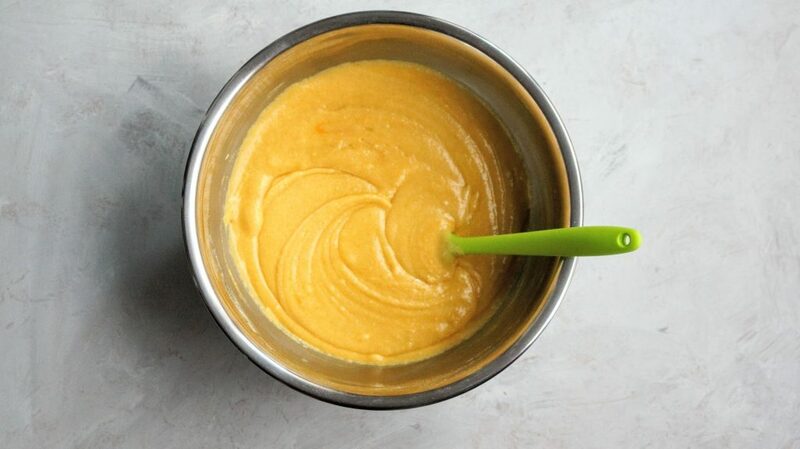 A blend of dry ingredients, the turmeric yields the signature yellow color. Wet ingredients turn the batter golden in color. 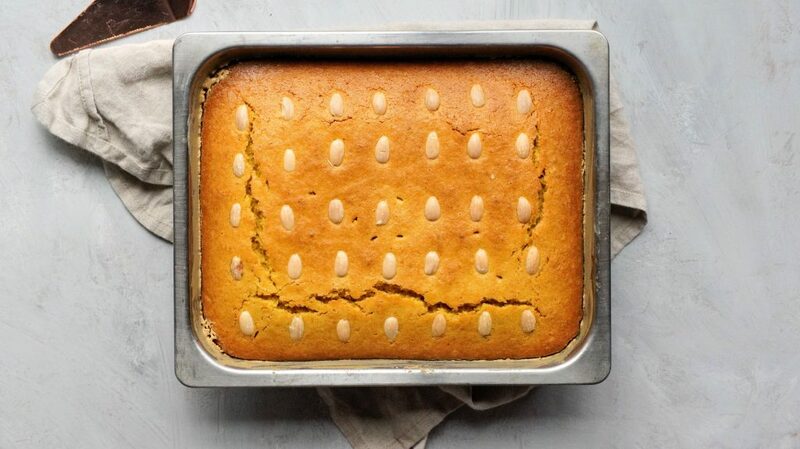 Tahini is used to grease the pan, which not only helps the cake from sticking but also gives the cake a nutty flavor. Rows of nuts line the top, the batter is thick so the nuts don’t sink. Coming out of the oven the smell is intoxicating. Don’t worry if it cracked a bit. This cake is meant to be simple, rustic and full of flavor. 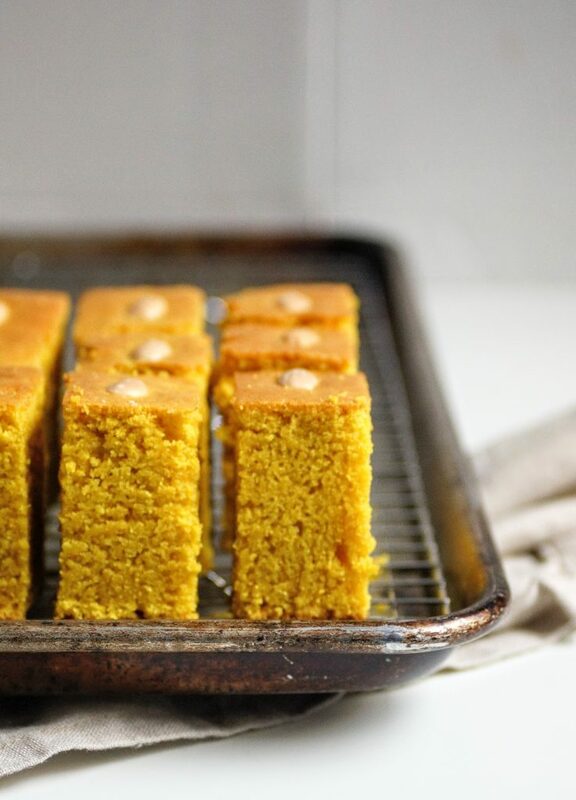 A delicious and simple cake combining semolina flour, turmeric and anise flavors. 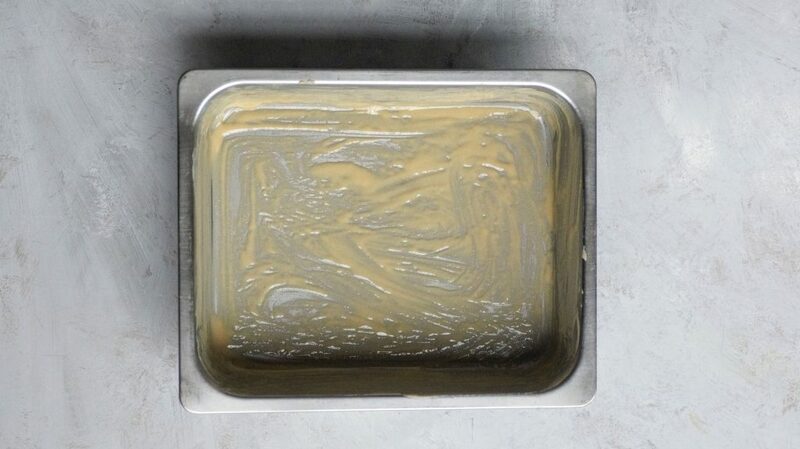 Prepare your 9x7 baking dish by coating with tahini. This will prevent the cake from sticking. 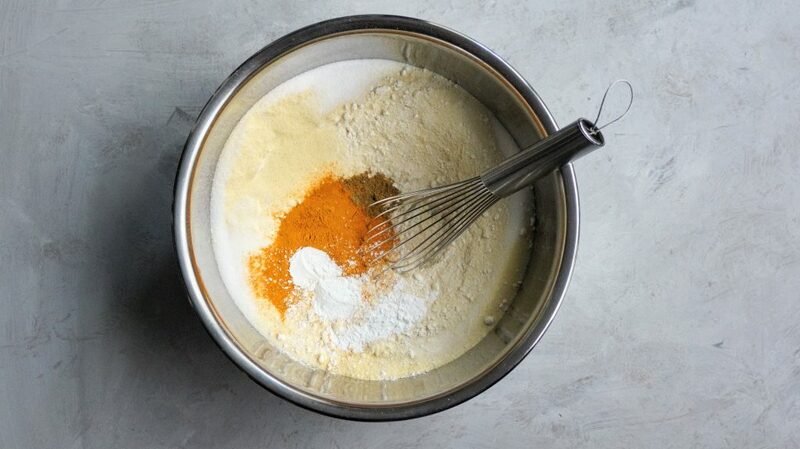 Combine all your dry ingredients in a large bowl and whisk to combine. Add in your milk, oil and orange blossom water and mix with a spatula until no dry streaks remain. Pour your batter into prepared baking dish. 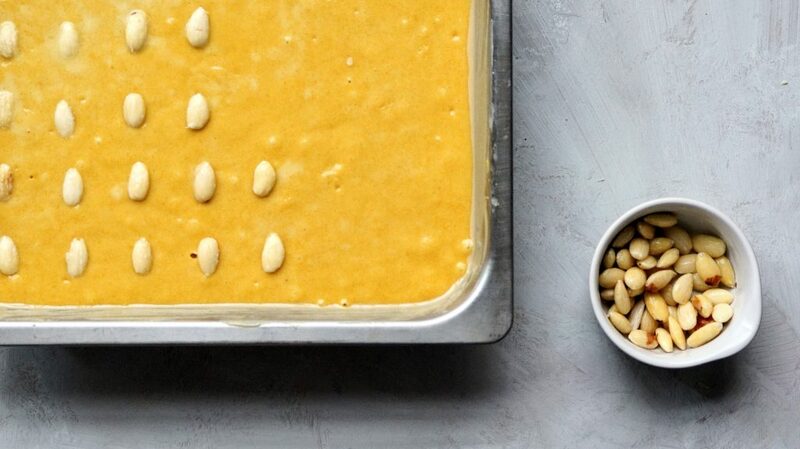 Top your batter with your blanched almonds or pine nuts into straight rows across and vertically. Bake for 50-60 minutes, until a tester comes out clean. Cool, slice and enjoy warm. Best to warm after the first day. Can be stored in a sealed container for several days to enjoy. *If using a larger baking dish, adjust your baking time, a 9x11 should be closer to 35-40 minutes. *Best to enjoy the day of baking, after day of, warm slightly. Thank you, love your recipes and your blog. I learned how to make a similar cake called Basbusa from semolina some years ago but I often have to leave out the rosewater because only a few shops sell it. Looking forward to trying this out on my family. this looks so gorgeous Cosette! I can’t get over that gorgeous orange colour!!! Awwww, thanks so much Georgie!!! Hope you are well friend. That makes me so happy!!!! So glad you are enjoying. Thank you for taking the time to comment.